I first encountered yoga in the 1970s when a sun salutation was a mere shadow of its incarnation today, like for example, not involving anything other than bending from the waist and moving your arms around. It has now ballooned into a minimum of two sets of 12 postures, which, in a pinch, are officially sanctioned as a fast-food version of a yoga practice if you don't have time for the full meal. In the decades since it arrived in North America, yoga has become well-entrenched as a "thing." 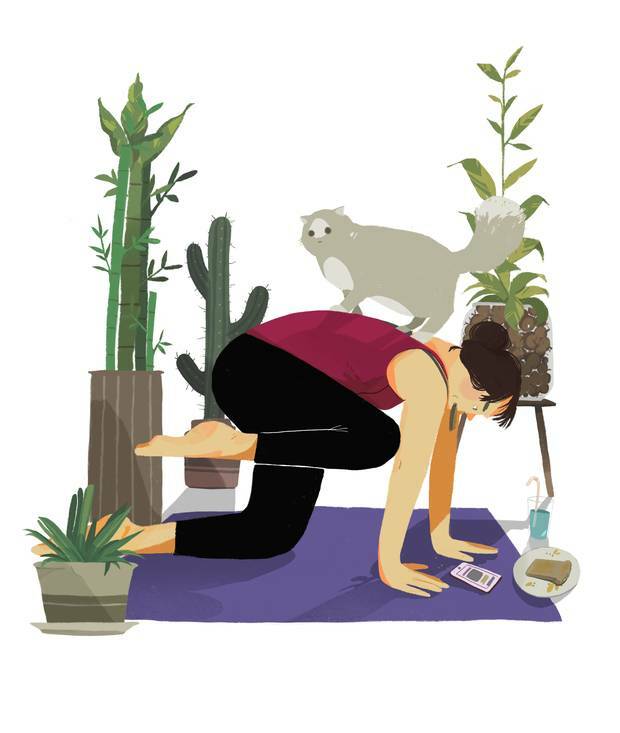 There are purveyors of yoga on every street corner, and yoga pants – a genre of clothing that barely existed in the 20th century – are on every bum everywhere, whether or not the wearer has ever darkened the door of a yoga studio. There are even men's yoga pants, which is actually a highly successful marketing ploy to reposition sweat pants into funky Sunday-brunch attire. Today's yoga has more incarnations than Buddha himself, who by most accounts had only 28 versions. The most no-frills variety is Hatha yoga, a practice that has fallen out of fashion for no good reason other than the fact that it is completely boring. Hot yoga is currently a very popular genre, probably because it makes you sweat profusely while essentially standing still, giving you the illusion of having done something extremely strenuous. Then there is Ashtanga, which does not require heat to make you sweat because it is a non-stop sequence of moves reminiscent of your worst gym-class calisthenics nightmare. This style of yoga has the benefit of keeping you squarely in the present moment because every fibre of every muscle is screaming loudly at you to stop. The antidote to Ashtanga is restorative yoga, where you lie on the floor doing absolutely nothing except drooling into a bolster for an hour and a half, loving every minute. And this year, someone invented goat yoga. Near as I can tell, goat yoga involves goats wandering around during a yoga class. I can think of several ways this could go very wrong, not the least of which is what happens when this is an indoor yoga class without goat bathroom facilities. Anyhow, I think this proves there seems to be no limit to where yoga might find its next true expression. But regardless of which style of yoga takes your fancy, and especially in case none of it has so far, let me tell you what goes on in the average yoga studio these days. First, everybody brings their phone into the room. Never mind that the whole point is to be on an inward journey for the duration of the class: Their definition of being in touch with the universe means making sure they can deal with those life-or-death text messages right up to the first "Om" and immediately after final relaxation. Inevitably, someone forgets to mute her phone. This is not necessarily bad because it provides the opportunity for the rest of the class to meditate on the true meaning of patience while pausing for the mad scramble to find and banish the source of the Hotline Bling ring tone. Second, everyone has a preferred mat location. This means if you are attending a new class, you must respect the established locations of the regulars or suffer the consequence of nasty murmurs and frosty glances. That's because acceptable mat locations are in short supply, and to make things even more complicated, there is also a hierarchy of acceptable mat locations. The most coveted spots (in order) are the back corners, the back row, the sides and the front corners. The objective is to be closest to the door to be able to rush out as quickly as possible after class (thus nullifying any residual Zen results), maximize personal space and/or minimize the number of people you have to look at. Somehow I don't think this would go over very well in India. Snagging your mat happy-space means it is necessary to get to the yoga facility at least 15 minutes before class. Or it used to be sufficient to arrive 15 minutes early. At my studio, the mat turf battle has since escalated so that sauntering in a mere 20 minutes in advance means you are relegated to the middle of the room. But at least that gives you more preclass phone time. Third, there is such a thing as competitive yoga. These days, it's not enough to work within the confines of your own body: You need to strive for perfection of pose and to be better at downward dogging than your mat neighbour. Maybe it is just me, but competitive yoga seems like the penultimate oxymoron. But should you wish to participate in this anti-yoga yoga stuff, you need to get yourself to an International Yoga Asana Competition. This is where you get to show off your yoga "prowess" to the world and the assembled masses that marvel at your flexibility, contortionism and general athleticism. If you want to compete in the IYAC, you have to move successfully through six yoga poses within three minutes. I don't know about you, but I go to yoga three days a week and could barely trot out six yoga poses without prompting. But merely warrior posing, or dancer posing or even achieving a decent boat pose does not cut it here. The protocol at the IYAC is what in most circles would be considered extreme yoga, like balancing on your head while crossing your legs in an impeccable lotus pose, or doing the splits standing up, or casually perching on your hands with your knees resting on your elbows while your cat sits on your back (honestly, working on it). Buddha said there are three things that cannot be hidden: the sun, the moon and the truth. I am not sure he would feel the same way today about the "truth" part, but this is what I can say is true about yoga. It sure feels good when you stop. Marilyn Carr lives in Toronto.